DEBORAH CROMBIE: I think I want to be Harlan Coben. Incredibly talented and successful. A really nice person. Tall. (Well, maybe as tall as Harlan would be stretching it a wee bit...) And there is the gender thing, which might be a slight issue. All minor adjustments, I'm sure, none of which would be nearly as difficult as becoming the writer who says (as we mentioned earlier this week,) "Research? I just make things up." Here I confess to being THE neurotic researcher. I have to check every single detail, and if I can't find something out, I will tie myself in emotional (and physical--just ask my back) knots trying to figure out what MIGHT be right. You would think that after fifteen books, it would get easier. But Kincaid/James #16, To Dwell in Darkness, has been (excuse my British) a real bugger. 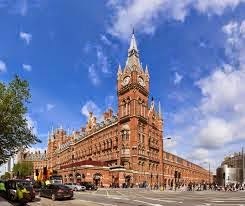 In some moment of madness, I decided I wanted to set off a bomb--well, actually an incendiary grenade--in the beautifully restored St. Pancras International Railway Station, which is now the Eurostar terminal, in the King's Cross area of central London. Why, you may ask? Because I was, and still am, smitten with St. Pancras. The original railway station was one of the marvels of Victorian design and engineering, and the station, and the accompanying hotel, are steeped in London history. After a long decline, St. Pancras came near to falling to the developers' bulldozers. But wiser, and probably more cash-savvy, heads prevailed, and the restoration is a thing of beauty and Gothic glory, teeming with human life and traffic. And then came the sticky stuff. Jurisdiction, procedure, all those little nit-picky technical details. (Do you know what happens to the British rail system nation-wide when you shut down a major terminus for even an hour???) Not to mention a very complicated plot that I could have set anywhere in central London, but chose to plop in the middle of St. Pancras. He left the dark blue Ford in the car park at Didcot Parkway Railway Station sometime before dawn. You weren’t likely to be noticed coming or going from a railway station car park at odd hours, nor was the car likely to be thought abandoned if left for a few days. A few days… Who was he kidding, after what had happened at St. Pancras? Maybe forever. But he couldn’t think about that, not yet, and at least in a railway station car park it would be some time before the car was tagged and towed, and even then nothing in it should link to him. After a quick check to assure there was no one else about, he stowed the supplies from the boot in his big pack. Then he wiped down everything he’d touched with a clean cloth, locked the car and pocketed the key. He stood for a moment, adjusting the weight of his heavy pack on his shoulders, gazing at the deserted station platform. Even in the dark he could see the towers of nearby Didcot Power Station. Ironic, that, as he’d participated in the protests that had got Didcot A shut down. And what had it mattered, in the end? A train horn hooted in the distance, the sound carried on the bitter wind. He shuddered. He couldn’t bear trains now. He turned east, towards the Thames, and began to walk. friend. And Google Earth. 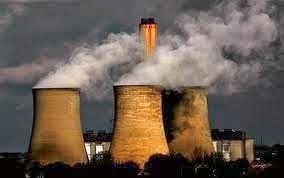 Is there really a Didcot Power Station? Yes, there is. And you can see it from the railway station. And Didcot A was shut down, in part because of the demonstrations of eco-protesters. It was one of the worst polluting coal-fired power stations in Britain. Didcot B is scheduled to close in the next few years. So, readers, what level of verisimilitude do you expect from authors? Are you willing to go with "Learn as much as you can, and then make up what makes sense and keeps the story moving?" I will buy pretty much anything in a book, as long as it makes sense while I'm reading it. Sometimes I'll think about it later and realize it really doesn't make any sense. The exception is if I know something is a fact and the author gets it wrong. Depending on what and how major it is, I'll probably let it just roll off my back. However, a bomb going off in a station? I don't think I know enough to know what parts you got right or wrong. You won't be getting letters from me about any errors there. Pretty much what Mark said. I think the crunch comes when there is an expert in that exact topic, or someone who lives on the very block you're describing. For books set in places I'm not familiar with or that use technologies I have no experience with, I accept the details on faith. In my own books, I'm not as obsessive, although I did delve pretty deeply into the life and caring of chickens recently, mostly because they delighted me and I had an expert or two in a five-mile radius. In my historical set about 130 years ago, I'm trying NOT to do too much research as I write the first draft or I'd never get it done. And then I look forward to diving into details of dress, transport, food, lighting, and language. I have heard that one must get the trains right or the historic train folk get very, very upset. Looking forward to your next book, Debs! Absolutely I will go with made up Debs! That means you'll get a few complaints from nitpickers, but I could live with that:)--and do. When I am reading a really good story, it is very rare for a made-up fact or two to interfere with my enjoyment. Especially on the little things. Even if it is something I know a lot about - say publishing or quilting - unless the error was just downright obvious, I can usually let it slide. For the most part, you are only going to get notes from the most picky of experts, and likely no matter how much research you do, they would still find something that you got wrong (even if they have to twist things to prove their point). I mean, it's not like you are writing a course manual - and let's face it, we all know there are errors in those as well. I will go with made up as long as it's done well. Make it believable and I'll go for it. There are too many cases of truth is stranger than fiction to be denying something might be impossible in a novel. Get it ACAP (as close as possible) then make it good! After all, who would fall for any version of the Nigerian 419 scam? And yet, the scammers make a living off of that little beauty. Deb, I'm like you, I research the heck out of everything. But when I'm reading fiction, I accept that it's exactly that: fiction. What I hate is sloppiness. I recently read a highly acclaimed novel about Vietnam during the war, and there were so many inaccuracies that a simple fact-check could have caught. But it was clear this author didn't care about accuracy of any type, and that made me uncomfortable with her book. If I trust an author, my feeling is that I must trust their choices in their quest to tell a story. Debs, this is so funny to read this morning since I just spent an hour or so on Google Earth researching a location for the scene I'm writing in my WIP, making sure the hotel I use is right on the river and directly in line with an old fire tower (that I'd already researched) where the climactic scene will take place. Obviously, I'm in your ball park. Like you, though, if I can't find out exactly what I need or it just won't work to be that accurate--200 cops at a bomb scene, too long a time to do something by the book--I'll try to work around it by making something up that feels right. And it usually will because I've done the hours on Google Earth or talking to experts or researching in the library. That's my feeling about it, too, Kim. I'm perfectly willing to go with things that make the story work better, if I trust the author's attention to detail on most things. But I will change the name of a real place if I feel that the using the real name in a story would be uncomfortable. The hotel where the murder takes place in The Sound of Broken Glass is a real place, but is not called the name in the book. The 12 Bar in Denmark Street, the famous guitar club, got to keep it's name. I heart Google maps, too! And I love hearing about another writer struggling because this new book that I've now turned in has been a stinker to write. The excerpt sounds FABULOUS! Can't wait to see it in print an get my grubby little hands on a copy. Linda, too funny! In the excerpt I posted, I checked a dozen photos on Google Earth to make sure you COULD see the power station from Didcot Parkway Railway Station. But that wouldn't bother me as a reader. What would bother me are things like the amateur sleuth going down in a dark cellar, where she suspects the killer is lurking, with no backup. Unless, of course, she (or he) MUST do it in order to prevent another murder, etc. Thanks, Hallie!!! And you will certainly get your hands, grubby or not, on a copy! But! I did have a woman recently, say to me--I just read THE WRONG GIRL, and if you go take that bridge over the Charles River like Jane did, you'll wind up in Cambridge, not Boston. I briefly freaked--did I make a mistake?? I thought about it, then said to her--well, not if you're driving the other direction. Oh, she said. You're right. So I say a little prayer of thanks every day to Google Maps, and those cute little arrows that tell you which way the street runs! Some basic research is always good! I read a book a few years ago set in a fictional town in Michigan (where I've lived all my life), by an author who ostensibly spends at least a portion of the year in Michigan. Therefore, I expect the book to be accurate in references to Michigan's geography, and yet the main character refers to "the bridge to Mackinac Island." There is no such bridge, and even the most basic research would have revealed this! I still read this author's books and mostly enjoy them, but I also still hold a grudge for this, and wonder why the author and editor didn't check the facts before the book went to print. Logic and consistency trump precision when it comes to "reality." As someone who lived 40 years in the DC area, I cannot tell you how many movies get the geography wrong. They always put one of the monuments in, but not necessarily in the "right" place. Still, it adds to the color. When I know a place, errors catch my attention, but they don't ruin the reading experience. How lovely that you set your story in St. Panchras station. I always loved that kind of Victoriana. When it comes to places that I know I am really turned off if a writer gets it wrong. I'm with you, Debs...obsessive with research. I sat all morning yesterday studying maps and old railroad routes, seeing how many stops there would be before my characters reached their destination and what some of the stations would look like. And none of this really matters. I just wanted to picture their journey. My foot is firmly in the "research, research, then let the story take it from there" camp. My gripe, as others have stated, is when an author gets something wrong because they haven't bothered to do any research. A favorite author--love her books, still read them, once in a book had characters in my profession--the author dissed my entire profession in that book, but a little bit of research would have shown her that her thoughts were 25-30 years out of date. That still rankles, as she prides herself in being a professional in her 'real' profession. I expect obvious easy to check details to be correct. One Arizona author who writes books set in areas she should be familiar with shortens distances, changes geographical relationships and moves landmarks and that is wrong IMO. The nit-picky details can be changed to fit the book! Well, I love historical fiction, so I usually am hoping that the major events, places, and people are accurate. But, having said that, I also love a good story, so I don't mind a plausible bend here and there. Mysteries, that aren't necessarily historical fiction, are allowed much more lead-way in my book. I become so engrossed in the stories and characters that the setting can be entirely made up or altered. Of course, I do so love coming across recognizable items in places I've been, such as the marvelous Key West (Roberta gives me so much to enjoy in memory lane there). Having said all of that, even if a mystery isn't touted as a historical fiction one, there are some series that I've come to expect certain accuracies about the location, not complete down to the right way on a one-way street, but some overall aspects that I could delight in if I visit said places. Debs and Julia, both of your series serve as road maps in my mind to two areas I'd like to explore more. In fact, I keep lobbying for Debs to lead a tour of at least the London locations in her books. Rhys, I look to the Molly Murphy series to give me the broad strokes of early New York City, but I don't know enough to realize any minor deviations, and it really doesn't matter. I am smitten with Hank's series with Jane and Jake because of the action of the crime solving and the characters involvement in it, so location becomes less important, although I would love to visit Boston and enjoy tidbits about it. I have to say that Hallie's information about New York City really peaks my interest, and it is rather an integral part of my enjoyment. Susan, I just received your books from Amazon on Wednesday, but part of the appeal to reading them is the WWII connection and England's involvement, so, while I certainly don't possess the expertise to scrutinize (and wouldn't anyway), I am looking forward to some historical connections. So, I guess the above is a long-winded way of saying that I think readers develop different expectations from different authors, and for me it is a matter of more general adherence to facts from most authors in the mystery genre, my favorite genre. I am reading mostly for the story (and characters in series, too), and I don't expect a non-fiction account. Of course, what has amazed me as I've gotten to know mystery authors more is the intense devotion to research and factual information. You all work damn hard to put things right, and I thank you for it. I think that your all's attention to detail far exceeds most people's expectations or awareness of it. As Edith stated, "diving into the details of dress, transport, food, lighting, and language" are items that you all take such care with, and we readers get to take for granted as part of your wonderful stories. Oh, and Edith, I love your dip into the chicken world. What novel is that in? I have 'Til Death Do Us Part in my "reading next" pile. See, there's a perfect example of what the reader is reading for or expects. I would read it just for the chicken part. LOL! The Google Earth tool is a new fact about writing that I've learned in this post. Too cool! And, Debs, with your love of maps, I'm not surprised that geography is so important to you, and you do it so well, too. I'm currently reading River of No Return, which is about time traveling. I want to be able to achieve this feat to forward to September and read To Dwell in Darkness. OK, I'll stop now. For me, once an author starts a series in either a realistic or unrealistic tone, I think the series should follow that. For me, the amount of research an author does on their books, shows in the plot, the characters, whether or not it can pull me into their lives or I'm on the outside looking in at the characters. Some author's plots/story line are really good, but not believable in real time. I love when an author Blends the main characters "personal lives" into the story line, they do have lives outside of work and that makes them seem "real"
Once I read book #1 in a series, if it "has me" I will read every book in series that comes along. That was a big error to me, even though the series is fiction, still a big error and Not considered "fudging", just plain error. I recently read Andrea Frazer's "Falconer" series....love the two main characters, they are like night and day, comical at times. Lesley Cookman also has a fun series written in current time. Even though books are fiction, does not mean they can't be "real" if that is the way an author chooses to go....I just say, stick with it through out the series, either "realistic" or "Not"
Happy Writing and Reading everyone !!!! I think fudging a bit is okay. But I hate sloppiness. It tells me the author didn't want to work too hard on research. I listened to a book on tape years ago and groaned all the way through it. The author is prolific and well known. He set the story in New Orleans. His villain lived in a house on a hill (no hills in N.O. unless you count Monkey Hill at Audubon park)and this house had vast cellars (none of these either: they fill up with water). The mistakes were so ridiculous. I thought it was just pure-d-laziness on the author's part. MAr, wow. That is FASCINATING! YOu'd think someone would have caught that...um, I mean before you did. And Rhys, I so agree. I just want to picture it. And then I go from there. As far as I’m concerned, a reasonable amount of research ought to suffice . . . readers, after all, should have a touch of willing suspension of disbelief and enough trust in the author to accept all the believable details that make their way onto the page. I suppose I’d be upset if there were glaring inconsistencies in the story, but I’d venture a guess that they mostly happen when the research doesn’t . . . .
I’m looking forward to reading “To Dwell in Darkness” . . . your Chapter Eleven snippet is really quite tantalizing . . . .
Mar - those things bother me a great deal, too. One well known mystery writer had a character who had a baby, in one book of the series, and then, in the next book in the series, killed her off, unmarried and childless (thinking about/wanting a child). I was tempted to offer my editing services. Debs - in my (very humble) opinion, your research obsession is a large part of what makes your books so fabulous! I think it is partly why I love and respect them so much! Kathy Reel - yes, in 'Til Dirt Do Us Part! (Also in book three, Farmed and Dangerous, but that one isn't even turned in yet.) Thanks so much for noticing my little comment. See Reds, you have set up a community here! Congrats on doing a Harlan -- freeing, isn't it? I am 'just' a reader of fiction, not a writer of it, and I want a two-for-one experience when I pick up a book: one, I want interesting characters living an interesting story; and two, I want to learn something true about a real place. I prefer accuracy - especially if the story is based in history and place - over imaginary wanderings. So, I say keep firing up that GPS, Deborah! I echo those who say sloppiness in items that are easy to research and verify is almost unforgivable. (It particularly bugs me in movies when you hear the call of a bird and I know that bird would not live within 500 miles of where the movie is set - but most people wouldn't realize it - but it is something unnecessary and bugs me!) And authors who have set high standards for themselves in previous books, unfortunately have to maintain those standards. But I have read books where, in an introduction or in notes at the end of the book, the author says "Yes I know such and such is not accurate, but this is a work of fiction" and I have accepted this without any annoyance. If something has to be made up in order to further the plot line, as long as it is not something that asks the reader to completely suspend belief (like the novel is set in Paris, but the River Seine does not exist), it is fine with me. If, for example, you have to move a railway station a couple blocks, so be it. If you are going to deny the existence of the railroad or move the entire railroad line, I think there would be a problem. I have never recommended an author's books to my friends because their settings are accurate or given up on an author because they stretched the truth a little bit; I recommend them because of the plotlines, the characters and their writing style. Edith, thanks for answering my question about which book. 'Til Dirt Do Us Part is sitting on my table here beside me encouraging me to speed up my reading and get to it. And, yes, I agree that we have a wonderful little community here, so full of lovely people with which to spend time. I admire writers who do extensive research to make their novels believable and near truthful. however, because it is fiction, I understand a certain amount of "made up"details will be offered up as part of the dish. I accept that, and even encourage it. It lends to the drama. When it drives me bonkers is when it's on a drama television show particularly ones that involve the military. I loathe when too much dramatic license is taken!